Is it obvious how lactose intolerant I am? I suppose it’s a good thing to journal the substitutions, since there are probably a few other people who can not tolerate lactose in their diet. I found that substituting soy milk for milk works a little better than soy cream, but beyond that, it’s very much like making a regular souffle. I used Dayta Vegen Cheese instead of real cheese, and folded in some veggie bacon bits before popping in the oven. But this is the basic recipe from Julia Child, slightly altered to make it dairy free (except for the eggs, of course). 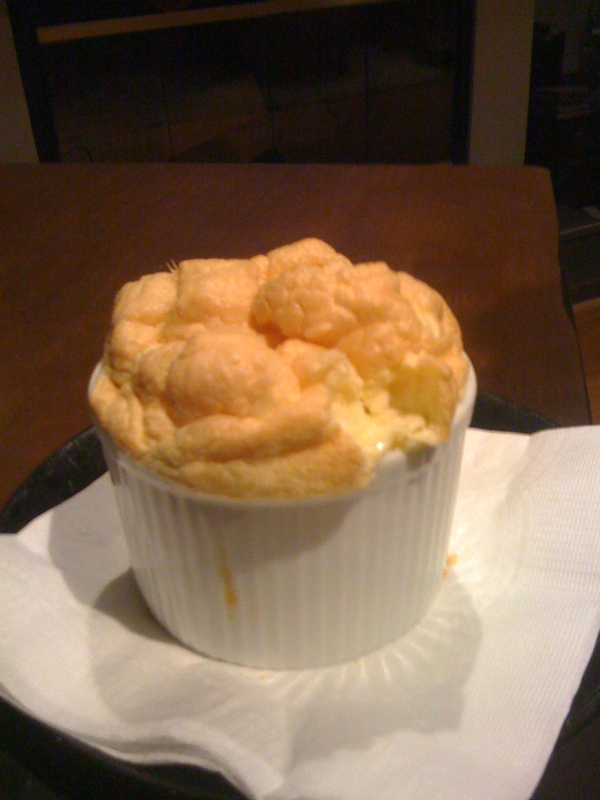 Next time I will pipe the souffle into the dish, and try to create a “Top Hat”, but since these are my fisrt souffles ever, I’m giving myself a break. I finished the meal with Creme Brulee, which also responds well to a lactose free version. This entry was posted on January 8, 2010 at 4:20 am and is filed under Uncategorized. You can follow any responses to this entry through the RSS 2.0 feed. You can leave a response, or trackback from your own site.